If you have ever spent anytime in the Phoenix area you have almost certainly heard of Camelback and Squaw Peak. 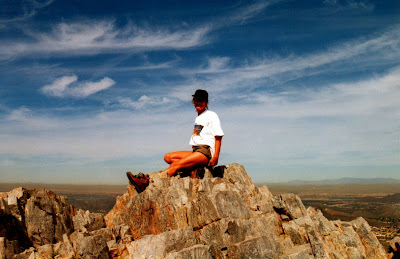 They are both mountain parks in the Phoenix metro area and are peaks with heavily used trails to the summit. On a nice day in either park it would not be unusual to see several hundred people making their way to the summit of either peak. Both Camelback and Squaw Peak have special significance to Margaret and I. They were the very first real mountains that we ever climbed years ago. They were in a way responsible for our whole “You have to stand on the high place” problem. The very first time to the top of Squaw Peak it took us several hours just to get to the summit. We later learned that people run to the top and back in 45 minutes. After a few times we got to the point where we could summit in 45- 50 minutes, but run to the top no not quite. After a while we have been to the top of each mountain so many times that we stopped keeping track or taking pictures. 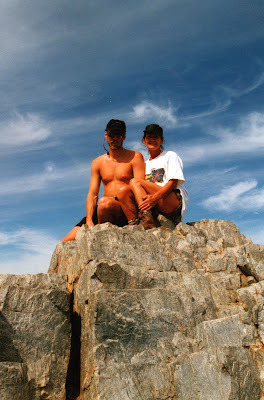 Almost every year when we were in Phoenix we would make several trips to the top of each peak. We have even gone up one in the morning and the other in the afternoon. Each summit trail is less than 2 miles. 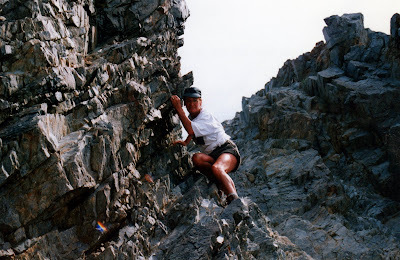 So they are not very far as trails go, however they are both fairly steep and rugged trails. Each mountain also has more than 1 trail to the top and we have been up and down all the available trails many times each. Since it can be very crowded on these trails at peak times the amount of people can make for difficulties in hiking the trails. 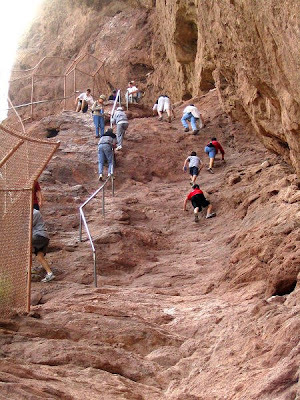 Below is one of the more interesting sections of the Echo canyon trail to the top of Camelback. You can see the number of people working there way to the top of the steep rocky section aided by the pipes in the ground. 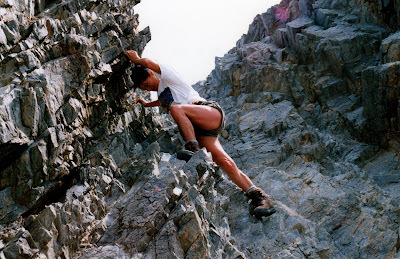 We have seen people climb these rocky trails in sandals, bare foot, and in every manner of dress imaginable. Some people have no common sense at all. We have gone to the top in the spring, and fall of the year, when its 70 degrees and when it 106 degrees. One particularly memorable trip to the top of Camelback occurred in September with the temps in the morning of around 90 degrees. We selected the Cholla canyon trail (the back way) to the top of Camelback which is a bit rougher and tougher of the two trails. We got a late start, but had plenty of water and were dressed for the sun so we weren't to worried. As we worked our way to the top the temps continued to climb. We stopped often to rest and cool down but the high temps were taking their toll. We eventually made it to the top, but there is little shade on a mountain top on 106 degree afternoon. Margaret did manage to find a shelter from the sun on the shady side of a pile of rocks where she plopped down and started sucking on her water bottle. Camelbacks sister peak just a couple of miles north, Squaw peak is now called Piestawa Peak. It sits in the middle of a Regional Park and is an imposing mass of sharp lava rocks with two trails running to the top. There are many trails running all over the park, but the most commonly used one it the summit trail near the entrance to the park. We have many times seen rescue squads running to the top or helicopters hauling someone off the mountain. Here are a few pictures from the summit over the years. There have been countless trips to the summit of these two peaks in our life. Here's to countless more!